The tune without the words, the song of hope, is everywhere in Malibu in May. In the garden, morning is a symphony—and sometimes a cacophony—of bird calls: the oriole ticks and clicks like an overactive geiger counter, the parrots in the neighbor's palm tree exchange opinions with the crows in the eucalyptus tree and the oak titmouse alternates between announcing "sweet, I'm sweet!" and scolding the resident blue jay with a cry that sounds like "cheater, cheater, cheater." At dusk the sky is full of the rush of swallow wings and the silent acrobatics of the bats. 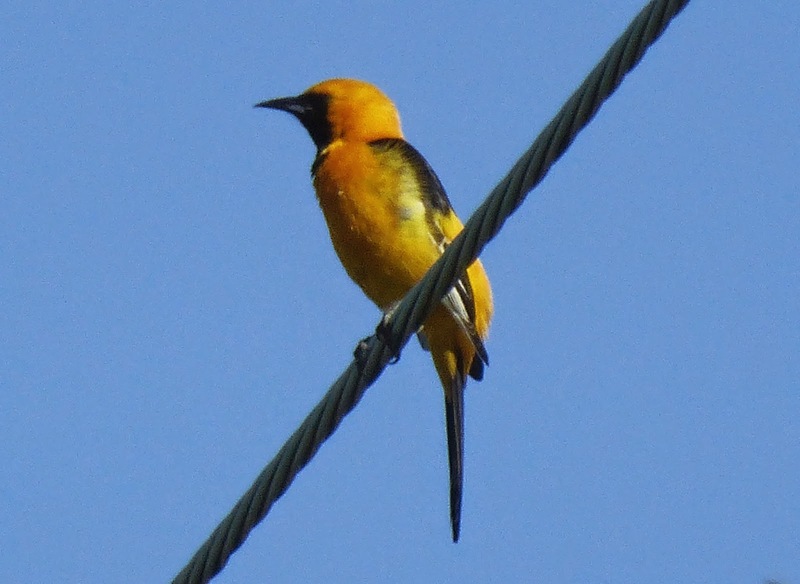 The beautiful hooded oriole is a frequent garden bird, but it is shy and often more likely to be heard than seen. Its call is a combination of ticks and twitters that sound like a geiger counter. 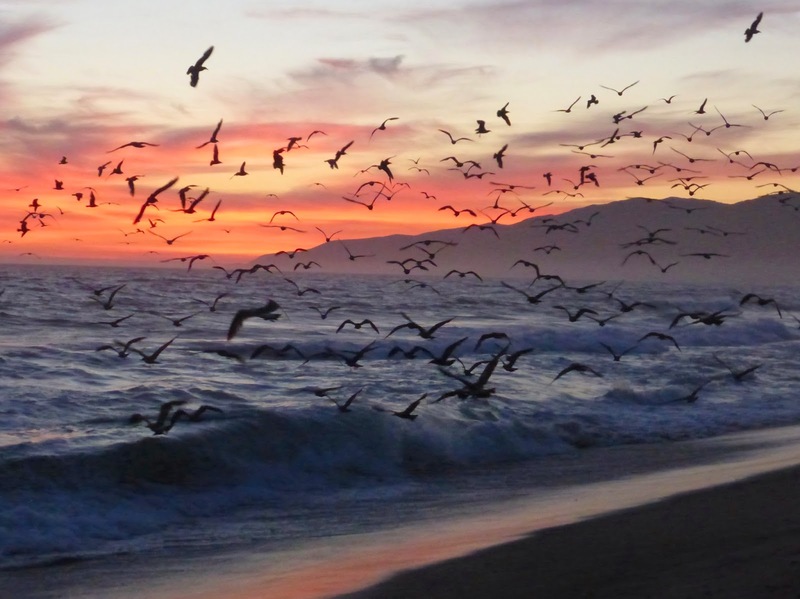 All along Westward Beach and Surfrider, thousands of elegant terns swirl and call, transforming the scene into a tableau from a snow globe, and the pelicans have returned, too, graceful, huge and pterodactyl-like. A flock of California brown pelicans takes to the sky. You can see the little puffs of sand kicked up as they launch themselves into the air with powerful wings. Brown pelicans really are giants, their wingspan ranges from six to eight feet. Last week, it seemed that there were just a few of each, this week, hundreds have gathered at Zuma and Surfrider. Flights of pelicans can be spotted all along the coast and the clamor of cries from the huge convention of terns at Surfrider can be heard from PCH. The sky fills with the sleek white wings of the aptly-named elegant terns. Like the Heermann's gulls, the terns have returned from their breeding grounds in Baja. And like the gulls, the elegant tern is also listed by the IUCN (the International Union of Conservation for Nature) as near threatened, although you wouldn't know it to look at the numbers currently present in Malibu. A group of elegant terns gather on the sand at Westward Beach. May is also a good time to look for more unusual species. 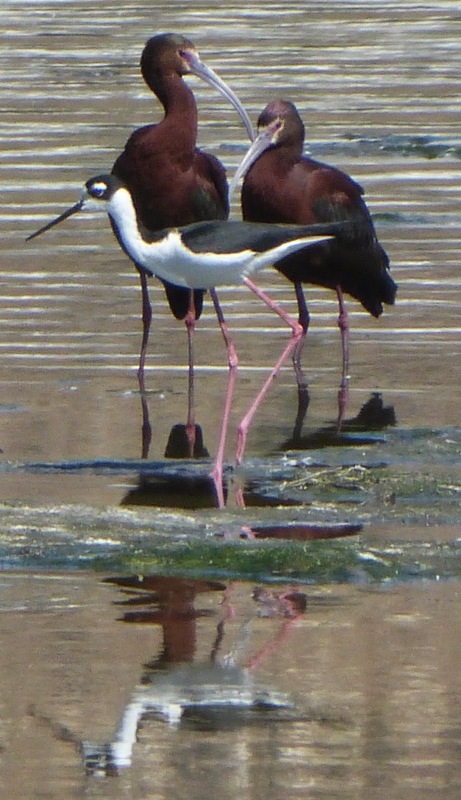 There were stilts in the main channel of Malibu Creek this week—wading birds with impossibly long, thin, pink legs, and a pair of white-faced ibises—a species this bird watcher had never seen in person before. The brants were there, too—small wild geese stopping for a rest on their way north, but the terns and the pelicans are the most conspicuous harbingers of summer. 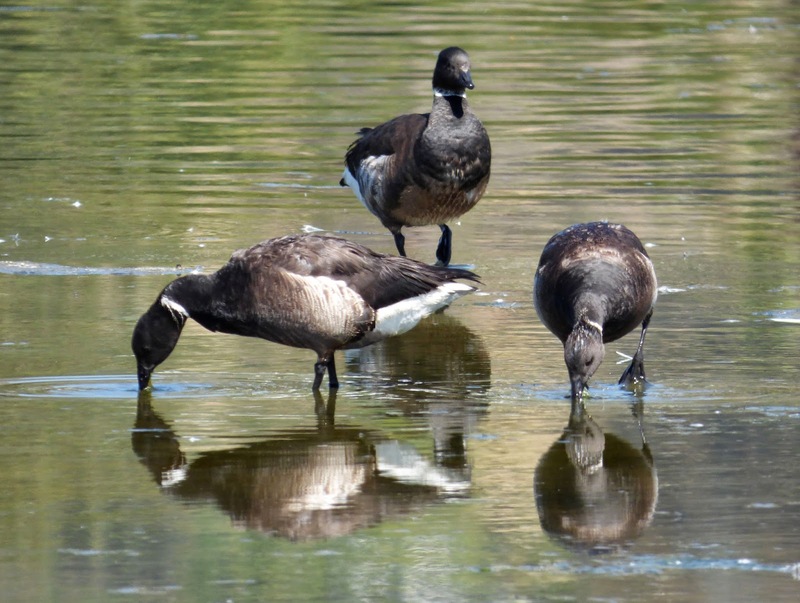 A trio of brants—small, short-billed wild geese—dabble in the main channel of Malibu Creek. 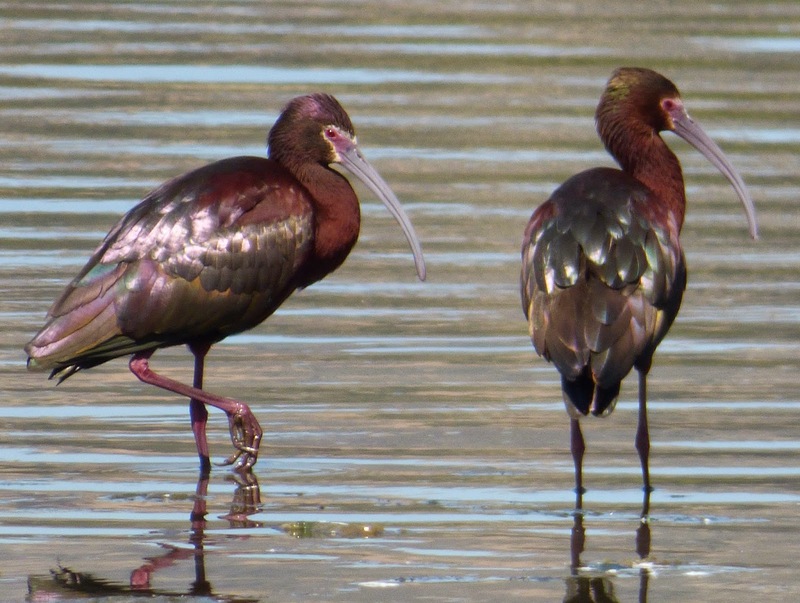 These are white-faced ibises. The photo doesn't do their spectacular iridescent plumage and bright pink eyes and legs justice. I know the ibis is the symbol of the ancient Egyptian god of wisdom, Thoth, but they looked more like something out of Lewis Carroll to me. While I was trying to get a good shot of the ibises I was photobombed by an black-necked stilt, another candidate for a Wonderland native. The pelicans and terns were late this year. The crash in the sardine population that is being blamed for the sea lion unusual mortality event may be responsible for that, but its grunion season now, and the tiny silver fish that spawn on the beach at the new moon in spring and summer are essential for marine mammals and sea birds. Grunion will be running almost every night during the first week of May this year, thanks to the full moon. The May grunion run is an opportunity for to observe, not join the feast. The first three months of the grunion breeding season are off limits to human fishers to give the fish a break. It's a bonanza for birds and marine mammals, with many diurnal species showing up in the middle of the night to take advantage of an all-you-can-eat fish dinner. 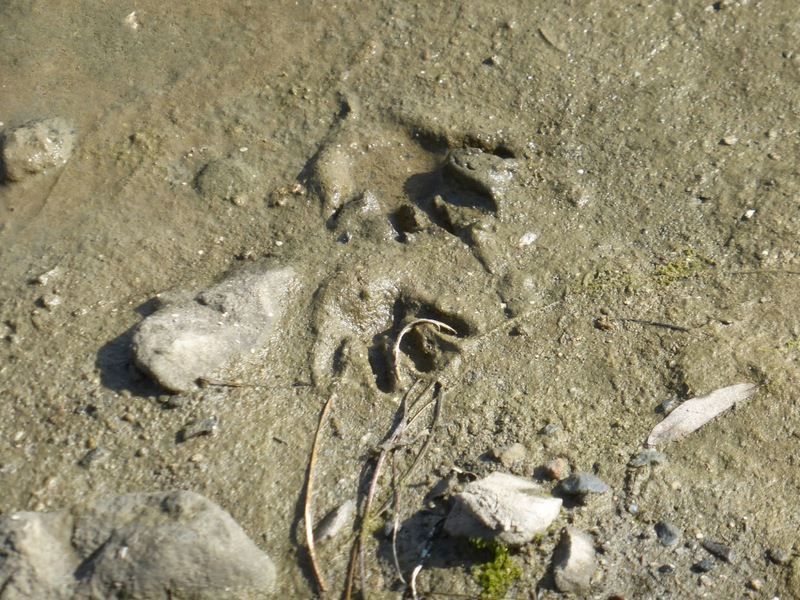 Raccoon footprints in the mud near the mouth of Malibu Creek indicate grunion may have been on the menu for more than sea birds. Here is the May grunion run schedule. Click here to see the Department of Fish and Wildlife's entire 2015 grunion run time chart. Tu 10:30 p.m. - 12:30 a.m.
We 11:05 p.m. - 1:05 a.m.
Th 11:45 p.m. - 1:45 a.m.
We 11:20 p.m. - 1:20 a.m.
For the struggling sea lion population, the arrival of the grunion couldn't come too soon, and the tiny silver fish also attract common and bottlenose dolphins—absent for much of the spring due to the lack of bait fish, back to the Malibu coast. 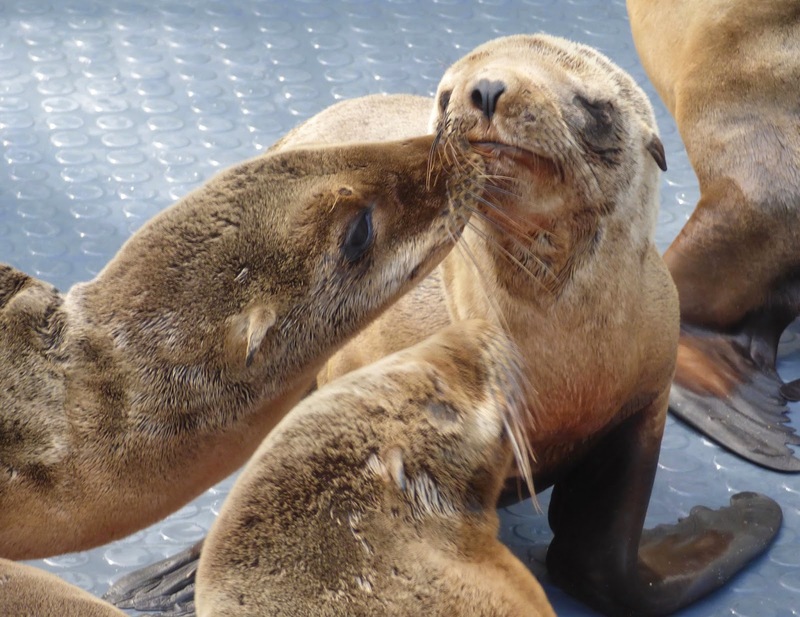 Sea lion pups rescued by the California Wildlife Center, being treated for malnutrition and dehydration in March. 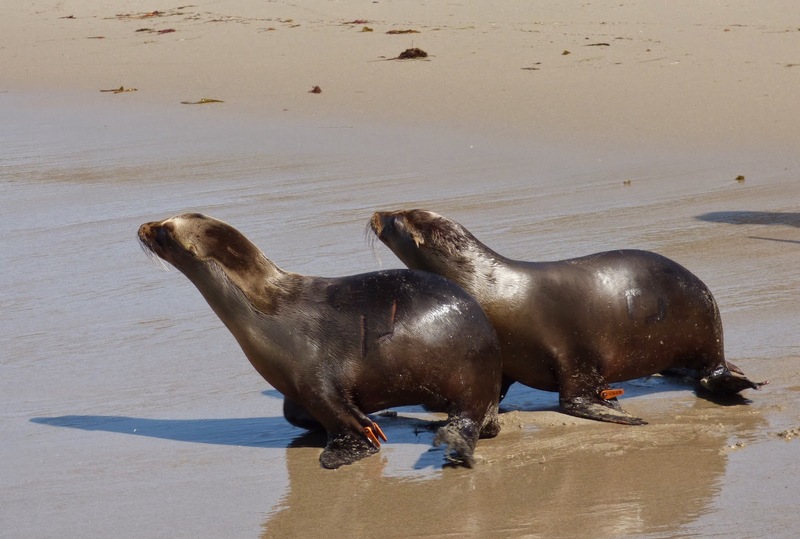 Two of the same CWC sea lions, healthy again and headed back to the ocean for a second chance. You can read about the release event, and view more photos here. Grunion are an essential food source for the Malibu Country Mart's colony of egrets and herons, too. Raccoons, coyotes and the ever opportunistic crows joining in on the fish feast. You never know what you'll see on a grunion night, darkness and silence, or something extraordinary. Harried egret parents are taking advantage of the spring grunion run to provide food for their young. Nesting real estate at the Malibu Country Mart was at a premium this year. 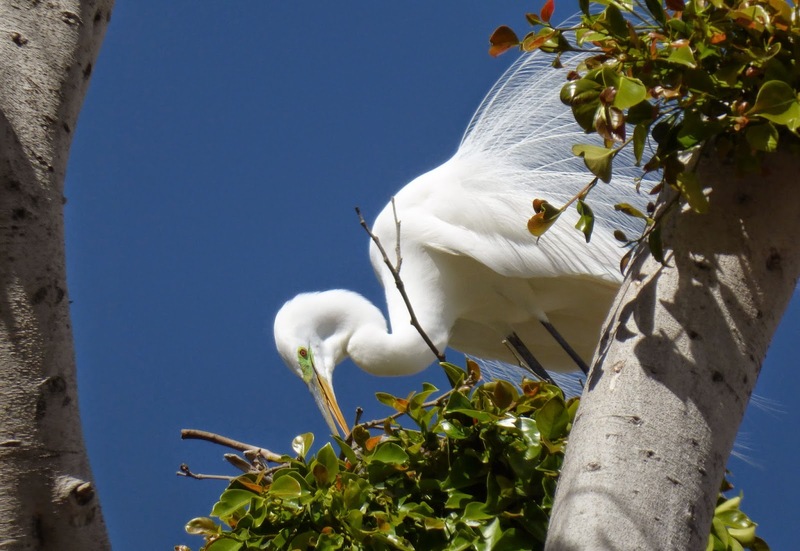 The ficus trees at the shopping center that are the favorite rookery—or heronry—for snowy and great egrets and black-crowned night herons, were pruned hard over the winter. The foliage is just starting to grow back, but there's at least a few nests like this one, which is already full of hungry and vociferous nestlings. 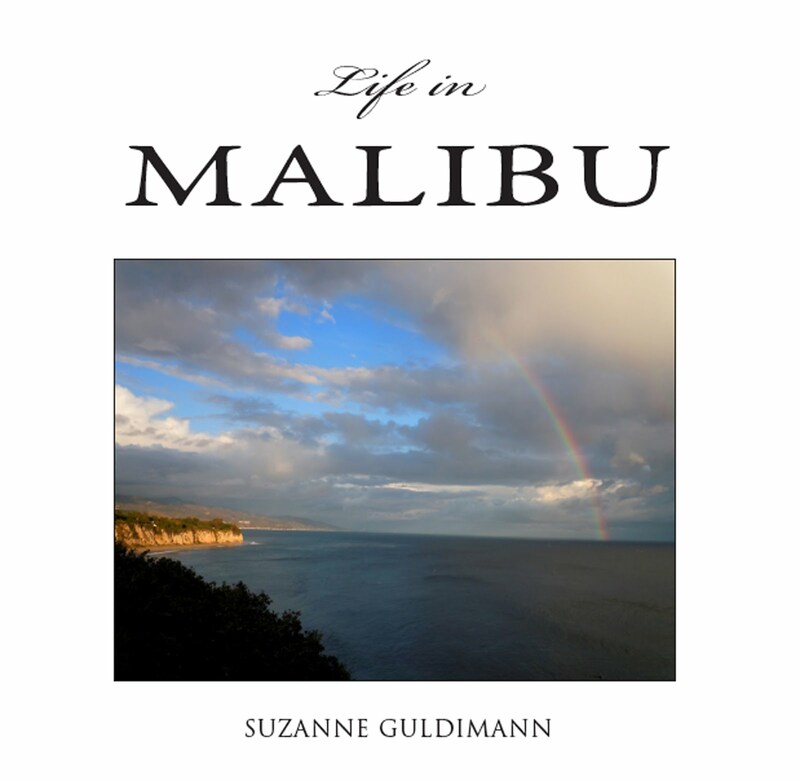 May is the time of rebirth, of love and joy and exuberance, of hope, but in Malibu it also brings a sense of loss. 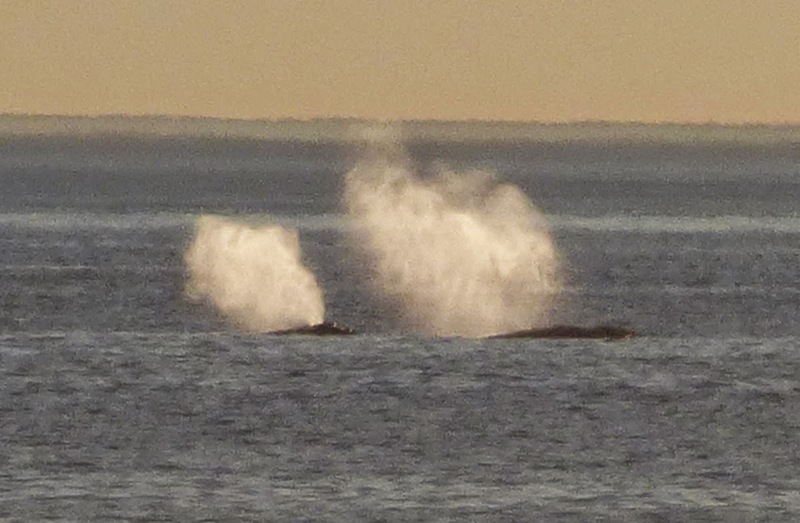 It's the end of the gray whale migration. All through the winter there’s the chance—and the hope—that a morning walk or a trip to the beach at sunset will offer a sight of whales. When the last few stragglers have left the warm southern seas and sailed past Point Dume on their way home to the arctic it feels as if some essential magic has gone with them. A gray whale and her calf pause at Zuma Beach on the long journey north to the arctic circle. For me, part of that is grounded in the fact that when I was a child there was the very real fear that the whales would go and not come back. 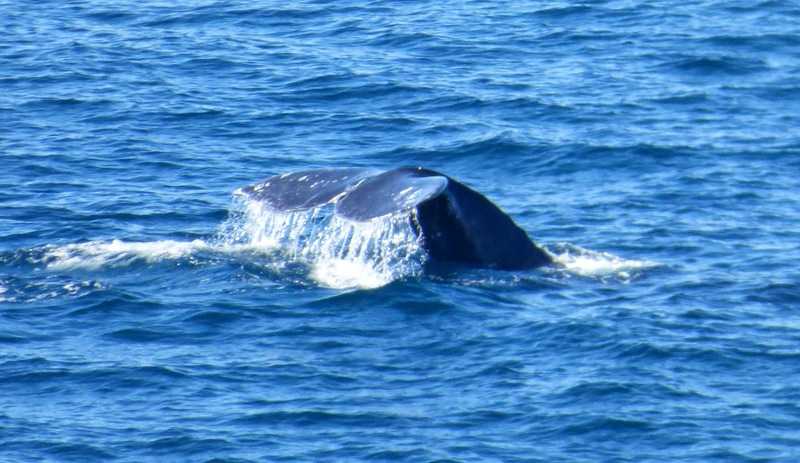 Whales still need protection, they face serious threats that range from pollution to ship strikes and Navy sonar, but they are still here, thanks to passionate conservation advocates who fought and continue to fight for their right to live. There's an added poignancy in Malibu, since Point Dume was the location of the last commercial whaling operation in California. A total of 250 California gray whales were caught, killed and diced into dog food off Paradise Cove. Whereas, whales and dolphins are known to be highly intelligent and emotional creatures that live in families and other social groupings, associations that last for most, if not all, of their lives and therefore deserve the right to their own freedom and lives. The proclamation was a purely symbolic gesture, since the city has no authority over anything below the mean high tide line, but it was the first time an American city has officially recognized the right of cetaceans to live undisturbed. 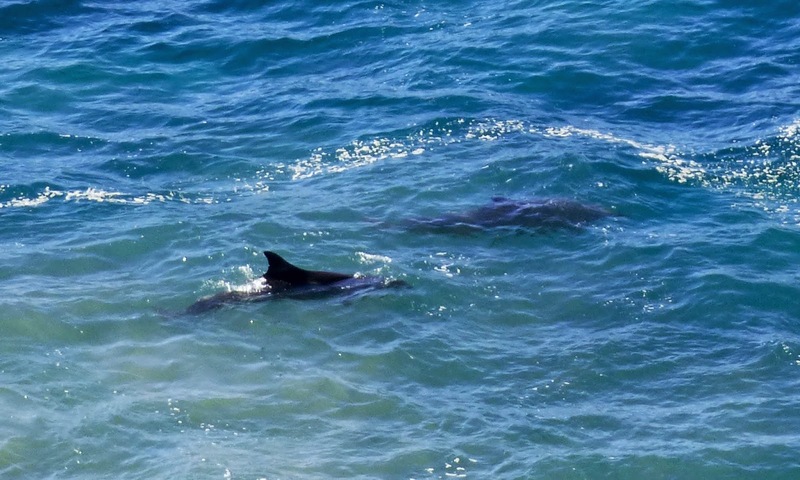 A pair of bottlenose dolphins swim past Point Dume, enjoying freedom and life. May is a reminder that that things can change for the better. The California brown pelican, the snowy and great egret and the gray whale have all been snatched back from the edge of extinction. 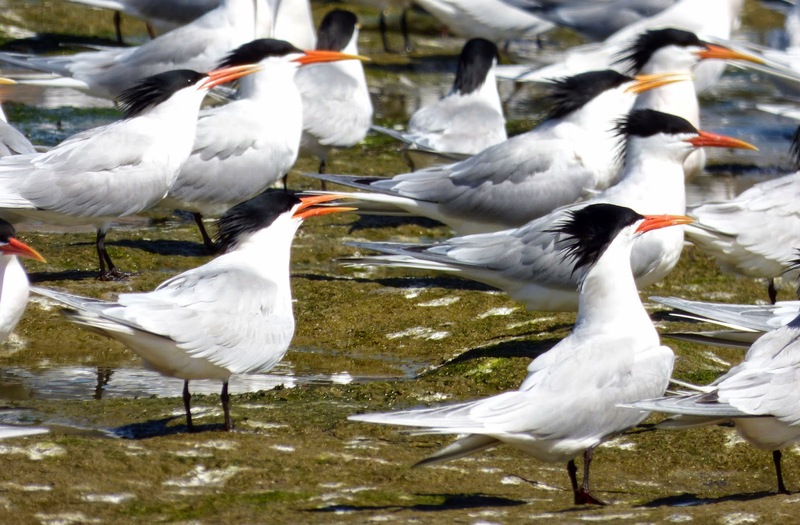 The tern's fate is less certain, despite special protections in California, but there's hope for it. There's hope for everything. The "tune without the words" is the anthem of the conservation movement. While it's fun and interesting to observe the natural world, it can also be important. We have to know what is there if we are going to protect it. And appreciating it isn't enough, we have to fight for it, too. So there will continue to be grunion, and sea lions, and dolphins, and so there will still be terns in May, and the whales will return in December—this year, and next year, and a hundred years from now.